Character: Brewed with coconut palm sugar instead of candi sugar. Deglet Noor dates and Black Mission figs were added during active fermentation with a traditional Abbey yeast strain. Here we have an amazing bi-coastal collaboration (or as they call it, a Dubbel Coast Collaboration) between California’s Alesmith Brewing Company and Florida’s Cigar City Brewing. This collaboration is a unique take on a Belgian Dubbel. This beer was brewed once in 2013. I don’t believe this beer has been brewed again. This beer is not available here in Texas, so I have to send a huge shout out to Jorge Espinoza of animebeers.com for sending me this fine beer. It was, in fact, his website that introduced me to this beer. After seeing Dubbel Dare posted on his site, I knew I had to get my hands on this beer. The name and label of this beer really interested me. The label base is a nice blood red color with which featured bright green splatters with a comic font in bright orange with capital letter D’s in bright blue, resembling the late 80’s/early 90’s Nickelodeon game show, Double Dare. This was a nice throwback to my childhood, as I was 9 years old when the game show first aired on television. Poured into a stemmed slender goblet, Dubbel Dare’s appearance was a semi-hazy mahogany color crowned with a thin layer of head, which was off-white in color and bubbly. There was not much of head retention, as it quickly vanished, leaving little to no lacing down the glass. The appearance was very inviting, as it made my mouth water as I gazed upon the glass when photographing the beer. The aroma was a god mix of dark and tropical fruits up front. Hints of figs, dates, pineapple, apricot, plum, mango, banana, and slight sour apple assemble together in my nose. There are also traces of sweet brown sugar, peppercorn, caramel, and spices. I do always find traces of fruit cake within a Belgian Dubbel, so of course this scent was present, yet again. The taste is nicely balanced with nothing overpowering the other here. There is a nice body of caramel malt, sugary sweet syrup, mixed with dark fruits like dates, figs, plums, and raisins. The taste that I like most about this beer is the nice blend of spices and tropical fruits. Hints of flavors of banana, apricot, mango, pineapple, and some sour apple. 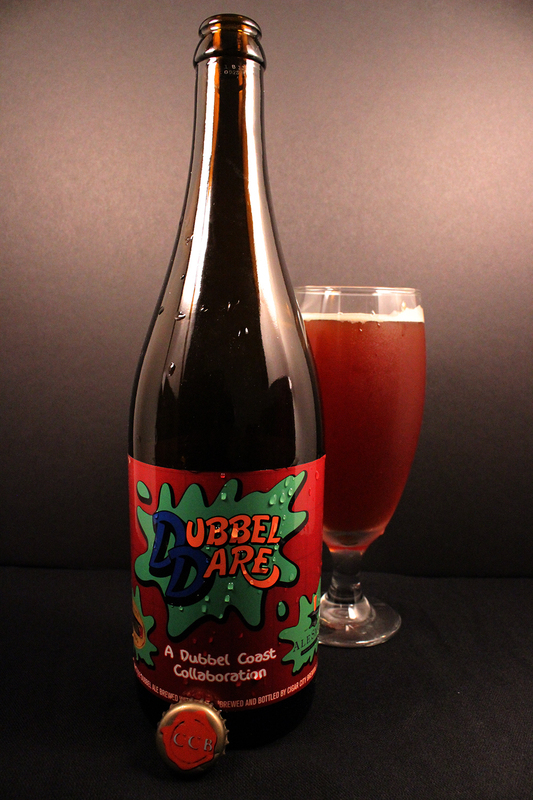 Dubble Dare has a medium body with a slick and syrupy mouthfeel. There isn’t much carbonation, and definitely not a bitter beer. Overall, I was very pleased by this beer, as i gave it the highest rating here on BeerMetalDude. Here is a beer that won me over from first glance at the label to the experience of drinking this amazing beverage. I enjoyed the tropical fruit notes that hit the nose and taste buds, along with the normal Belgian Dubbel qualities. Again, a huge thanks goes out to my Cali connection, Jorge Espinoza. Please be sure to check out his amazing beer review blog at animebeers.com. Metal Connection: Annihilator is a Canadian Thrash Metal band, who began in 1984, and is still present and thrashing out. One thing remained constant in this band, and that is the presence of guitarist, Jeff Waters. Since 1993, Jeff Waters is basically Annihilator, playing all guitars, bass, backing vocals, and sometimes lead vocals with a few guest musicians helping out for tours, and some studio work. The song chosen for this Metal Connection come from the band’s 1999 full length album, Criteria for a Black Widow. On this album, Jeff Waters performed all guitars, bass, and backing vocals, with the help of Ray Hartmann on drums, and Randy Rampage on vocals. Hartmann has played on 4 studio albums by Annihilator between 1989-2001, and Rampage has been on 2 studio albums, a live album, and a couple of demos between 1988-1989, 1999-2000). The song chosen has a respectable title of “Double Dare,” a song that I believe, is about facing an enemy within yourself, fighting to stay alive.